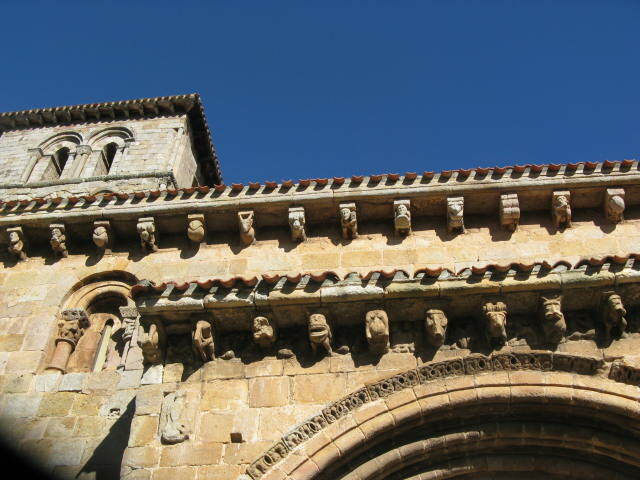 In the foothills of the mountains that stretch across the long northern coast of Spain, the tiny village of Cervatos with its twelfth century parish church of San Pedro conceals a possible clue to the pagan origins of the tradition of carnivals, like the one at Laza that I wrote about in the previous post. 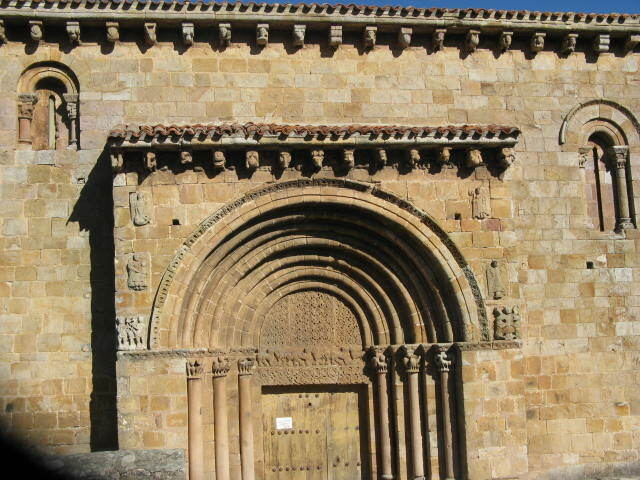 I visited here in the fall of 2009, I had done a lot of research on the boundless number of small village churches as part of my delight in early Romanesque architecture and sculpture, the carvings found around the doorways and windows, on top of columns and under the eaves. The iconography is primarily and inevitably religious and Christian. Embedded in the facade around the arches over the door are various Christian motifs; on the left from the bottom, Adam and Eve and the Tree, Madonna and Child, and an angel; on the right, from the bottom, a badly eroded something-or-other, another angel and a bishop carrying his shepherd’s crook (I am saving the close-ups for the more interesting stuff). 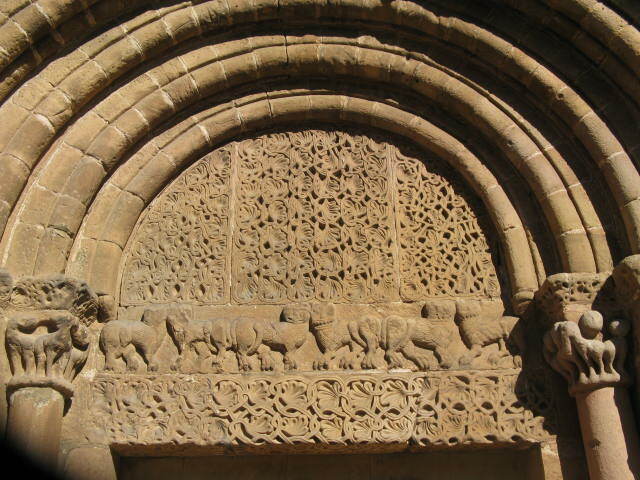 Immediately over the door is some marvellous lace-like tracery in stone and pairs of lions. I could do a separate post on the ambiguous symbolism of lions in medieval sculpture. 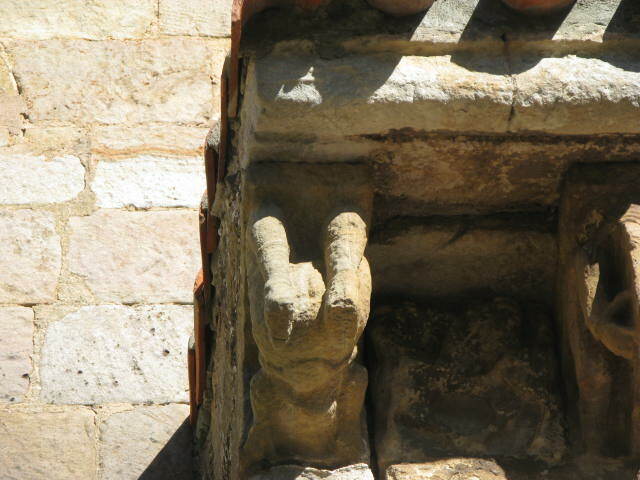 Other animals (always of symbolic import) displayed asymmetrically are almost ubiquitous on Romanesque capitals but I now want to get to the interesting stuff. We are in the hills, in the 12th century. Below on the high plains of central Spain, the Islamic kingdom rules. From north of the mountains, the regrouped Christian kingdom is gradually moving south in the centuries-long Reconquista. These mountains and the northern coastal areas had always been an enormous challenge to subdue, both to the Romans during their 5 or so centuries in Iberia and later to the Christian message. Today in the eastern parts of these hills live the Basque people with their unique language, culture and desire for independence. Life would never have been easy, the main stay would have been animal husbandry, primarily sheep, hunting and some cropping. In The Myth of the Eternal Return, the Romanian religious historian, Mircea Eliade, talks about the many different peoples whose shared story of creation began with chaos, with form and order being given by their deity. These people would recreate this chaos during a period of a few days in the early spring, a few days of chaos, characterized by music, wine, a breakdown in the barriers between the social classes, the wearing of masks and promiscuity (echoed in today’s grand carnivals in places like Rio.) This recreation of chaos and the subsequent return to an ordered world somehow guaranteed the community’s survival; the women would safely give birth, that ewes would lamb, the deer and other prey would be abundant, the crops would ripen, and the weather would be favourable. Regardless of their conversion to Christianity and its different story of creation, these hill people would have held on to their old practices. 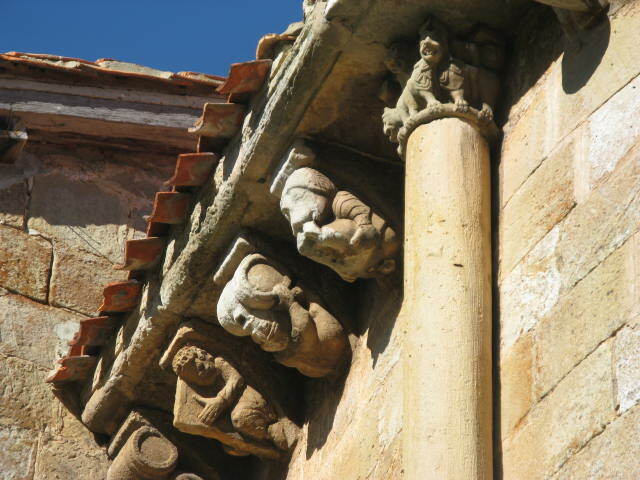 And, evidence of this is very clear in the other sculptures on this church in Cervatos, the corbels under the eaves and the capitals in the upper windows. We see musicians, acrobats, masked creatures, animals, acrobats and wine barrels galore. My camera at the time did not have the zoom power of my present one. Sorry! An acrobat, a tumbler, what a wonderful symbol of these few days of the world-upside-down! I will first draw your attention (if I can tear you away from the first two up top here) to the one of the right – a person is throwing aball; these were days without work, devoted to all kinds of play. These were normally people who would have worked most of the time in order to survive. The first one is right out of an Indian temple, a page from the Kama Sutra; with that clue, you should be able to figure it out, a rather athletic position. 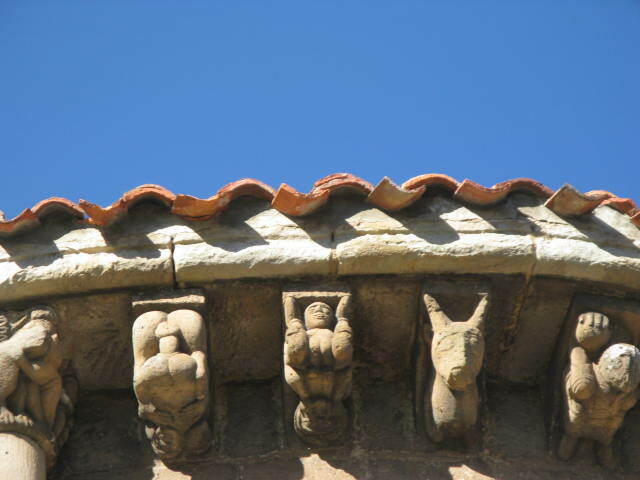 The second is a woman giving birth (she is upside down, the newborn appearing at the top) and the third possibly a masked creature (think of the carnival at Laza from the last post). Fertility was the key to survival. Other sculptures make this very clear. There is obviously much debate among scholars about the meaning of this woman and the male figure opposite her; there are a number of these pairs at this church. Eliade and a Spanish scholar whose dissertation I found on the web suggest strongly that it is not a message about lust and the attendant hellfire. She is wearing the hat of a married woman; her face is almost serene rather than showing the wages of sin. There is also no little devil or snake in the corner of this capital. Later sculpture, within not so many years, would make it abundantly clear about the mortal dangers to the soul given over to lust. The carnival period was not about this, it was a reaffirmation of the “eternal return” to order after chaos. Here we have the feminine principle side by side with the masculine principle. 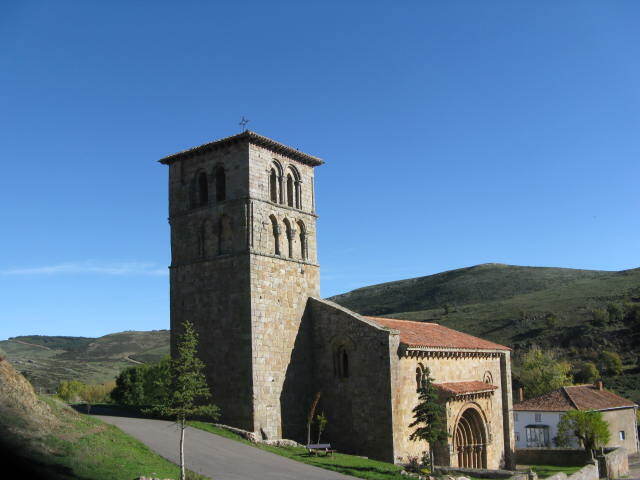 The Spanish scholar has documented similar pairings in small village churches throughout these hills. She also has photos of the quite different pairings sculpted a generation or so later when the central authority in the church, the Benedictines from Cluny, would have exerted greater control over the iconography in this area and across the whole of Europe. 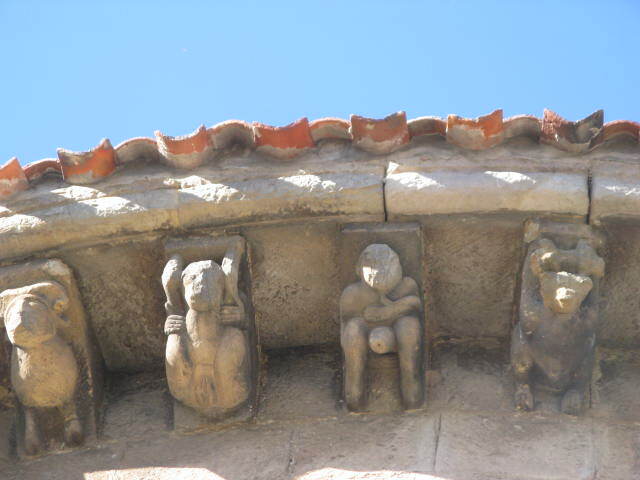 The isolation of this village as well as the enduring strength of the old religious practices (paganism) would have allowed these non-Christian motifs to play an important role in the iconography of this church. It is interesting that what we would call the more overt sexual imagery was not erased, that it did survive. Another insight into its significance to the community. Very interesting, this fascinating mixture of beliefs, but we need only think about the Mexican Day of the Dead, now part of the Christian calendar but clearly from a much older religious culture. Our carnivals today, New Orleans, Rio and elsewhere, preserve the fun and excesses, a chance to get away from our normal routines, without any understanding of how a few days of this topsy-turvey world were absolutely necessary if the numerous small, isolated communities were to survive another year. 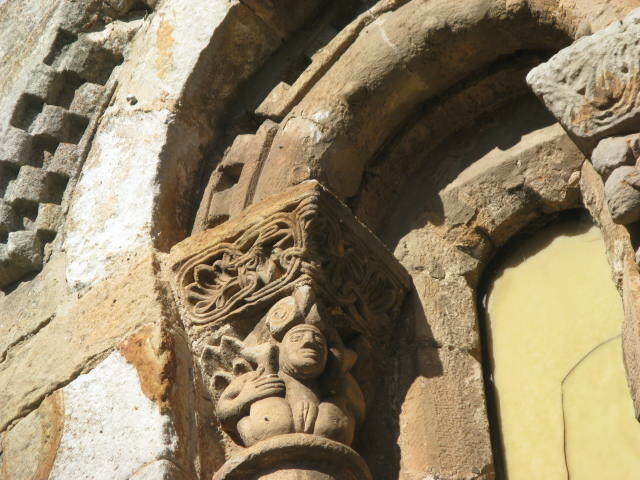 This entry was posted in medieval architecture, pagan roots of carnival, Spain and tagged ancient Christian, medieval, pagan carnival, Romanesque sculpture, sexual motifs medieval sculpture, Spain on March 18, 2013 by agnotarte.